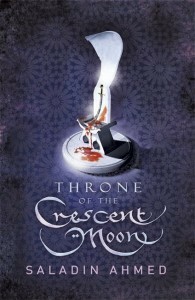 Throne of The Crescent Moon. Written by Saladin Ahmed. A Review. When I was a young girl my favourite books were The Iliad, Jason and the Argonauts, The Hercules Chronicles, The Thousand and One Nights with Ali Baba, and Sinbad the Sailor. I would spend days lost in the mythology and folk tales of these far off exotic places. I would draw and paint dreadful monsters and brave hero’s inspired by the words I’d read. Saladin Ahmed has brought all these wonderful memories back with this book. You can hear the peoples voices as you walk through the city, you can feel the dry, gritty heat. You can almost smell the blood and gore as Dr Abdulla Makhslood, his partner the Dervish Raseed, Zamia the Lion-Shape tribes woman do all they can to stop the super natural evil forces trying to take ultimate power over their land. Lovely characters. Nasty baddies. Nice touches of humour. Saladin is a true story teller and I look forward to more of the same.